When it comes to surviving in the wilderness, sometimes less is more. This is no more evident than in our latest Badass Knife of the Week: the Bushcraft Field Knife from Ontario Knife Company. This knife doesn’t have all the bells and whistles found on many of the current survival knives, but the Bushcraft Field Knife has two traits you need the most: dependability and durability. 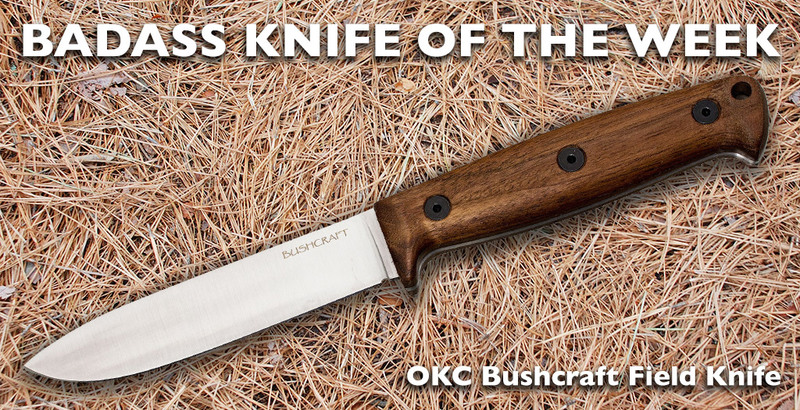 Winner of the 2014 Best of the Best award from Field & Stream Magazine, the knife shows OKC at its best. 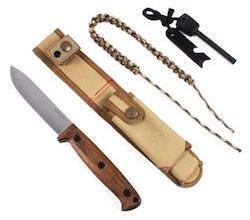 Starting at the top, the Bushcraft Field Knife features a 5-inch blade with a high, off center point and a flat grind. The 5160 steel, which is renowned for its toughness, has added chromium for increased hardness (53-55 HRC). Like any good survival knife, the knife boasts a full tang construction. Complementing the tough-as-nails blade is a handsome American Walnut hardwood handle, which is durable and feels comfortable in the hand. The slim yet hardy knife comes with a DeSantis nylon sheath, a paracord lanyard for additional security, and a fire-starter with striker. Whether you’re going camping or hunting, this bushcrafting knife should always be by your side. For more information on this Badass Knife of the Week, check out the product page for the Ontario Knife Company Bushcraft Field Knife.